✔ Series: Naruto Shippuden ✔ Manufacturer: Tsume ✔ Size: H: 18,8 cm/ D: 16,9 cm/ W: 11,9 cm ✔ Materials: PVC, ABS The second Hokage arrives in the XTRA by TSUME brand! Tobirama is the younger brother of Hashirama. His terrible hatred of the Uchiwa drove him to oust Madara from power. He bec..
✔ Series: Naruto Shippuden ✔ Manufacturer: Tsume ✔ Size: H: 16,5 cm/ D: 21,2 cm/ W: 13,8 cm ✔ Materials: PVC, ABS The third Hokage arrives in the XTRA by TSUME brand! Hiruzen Sarutobi, also known as the God of Shinobu, is the 15th figure of the Naruto Shippuden series made by TSUME. We have..
✔ Series: Naruto Shippuden ✔ Manufacturer: Tsume ✔Size: H: 18,3 cm/ D: 20,4 cm/ L: 17,9 cm ✔ Materials: PVC, ABS The first Hokage arrives in the XTRA by TSUME brand! 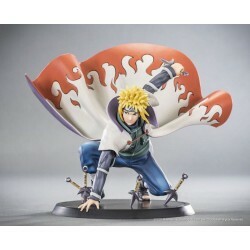 This is our 13th figure of the Naruto Shippuden series. Founder of the Konoha village with his lifetime rival Madara, he is the mo..
✔ Series: Naruto Shippuden ✔ Manufacturer: Tsume ✔ Scale: 1/10 ✔ Height: 14cm ✔ Material: PVC + ABS Eleventh character from Naruto Shippuden to join our Xtra by Tsume figures collection, Hinata Hyuga is also the first female to join our cast. We chose a scene from her fight against Pa..
✔ Series: Naruto Shippuden ✔ Manufacturer: Tsume ✔ Scale: 1/10 ✔ Height: 14cm ✔ Material: PVC + ABS The twelfth character to join our cast of Naruto Shippuden's figure is the Yellow Flash of the Leaf, fourth Hokage and of course, Naruto's father. The figure pictures him doing his signatu..
✔ Series: Naruto Shippuden ✔ Manufacturer: Tsume ✔ Scale: 1/10 ✔ Height: 14cm ✔ Material: PVC + ABS Itachi Uchiha, from the Naruto Shippuden franchise. X-tra by Tsume collection. Included one Itachi Uchiha figure in Edo Tensei mode and its chakra crows. Itachi Uchiha is our tenth Nar..